The Crossover Residential/Commercial Floor Water Heater is a revolutionary product and was designed to be the most highly efficient affordable residential tank type product in the industry. These models are Energy Star certified and combine the flow capacity of a 50 gallon tank type water heater with the continuous flow feature found in tankless water heaters. The Crossover is made with an advanced stainless steel integrated fire tube heat exchanger for superior performance. These unis are preset for natural gas and ship with a liquid propane conversion kit. 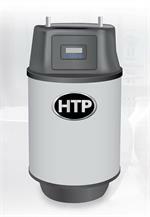 Its durable heat exchanger provides zero flow activation and scale prevention technology. The Crossover's Multifunction Control Panel features a customized temperature control system. This control system includes a user-friendly flow control, flow sensor, and a heat capacity control system. These controls work together to make domestic hot water even more comfortable by maintaining constant temperature while the unit is in use. The Crossover is fully condensing and achieves up to a 96% thermal efficiency rating, meaning that for every dollar spent on fuel, 96 cents is used to heat your hot water. That is a great savings! The industry average is as low as 70% for standard tanks. The RGH models have half the storage and twice the Btuh which results in a recovery rate that is 4 times faster than traditional storage units.